Maharajas' Express offers a royal journey traversing through the intriguing Indian terrain. Sojourn through the fabled Golden Triangle cities of Delhi, Agra and Jaipur. Jodhpur, Udaipur and Osiyan are other wonderful stops. 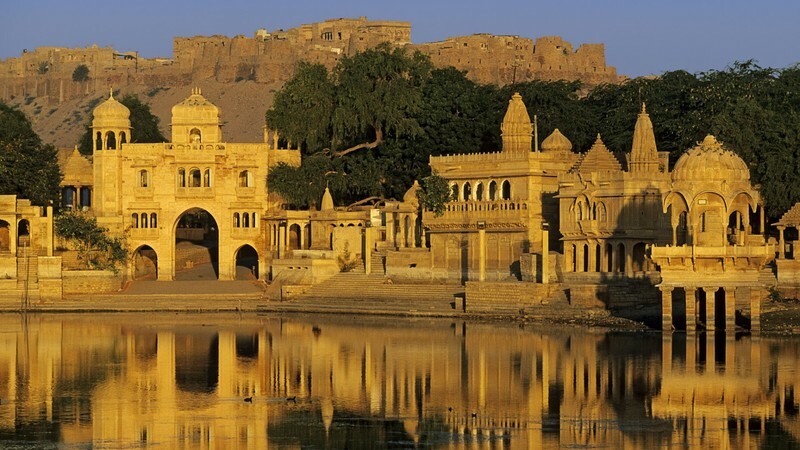 The 7 days and 6 night's tour package will let you discover the imperial facade of India. Beginning from Safdarjung Railway Station in Delhi, the journey will take you to the UNESCO World Heritage Site of Taj Mahal, forts & palaces in Rajasthan and the Gateway to the Thar Desert, collecting incredible experiences en-route. Browse through the itinerary for your perusal. Guests boarding the Maharaja Express have to report at least an hour before the train's departure at a pre-assigned venue in Delhi for the pre-boarding facilities. All final details related to the meeting point will be emailed or handed over along with the journey's travel vouchers and documents, around 14 days before the departure date. This morning, assemble at Delhi Safdarjung station at around 0800 hours and complete your registration and check in formalities for the Maharajas' Express, as you enjoy sipping into your welcome drink enjoying the Live Instrumental Music. The Maharajas' Express departs Delhi at 0900 hours for Agra. Enjoy brunch on board as you arrive into Agra. As you reach the 'City of Mughal Splendour', visit the Agra Fort. Return to the train for Dinner. Return back to the Maharajas' Express. You may choose optional activities such as spa at a five star hotel or a private shopping tour or Mohabbat the Taj show. Please contact the Guest Relations Executives for booking of Optional Activities. Early this morning, disembark to visit the world famous Taj Mahal, one of the seven Wonders of the World. The mesmerizing monument was built by the Mughal Emperor Shah Jahan as the mausoleum for his favourite queen Mumtaz Mahal. A UNESCO World Heritage Site, this incomparable marvel is constructed entirely out of white marble and is an architectural masterpiece with beautiful inlay work and marble screens. Later, enjoy relaxed breakfast at an exclusive venue. Lunch shall be served onboard. Proceed to Fatehpur Sikri, the deserted capital of the Mughal Emperor Akbar. 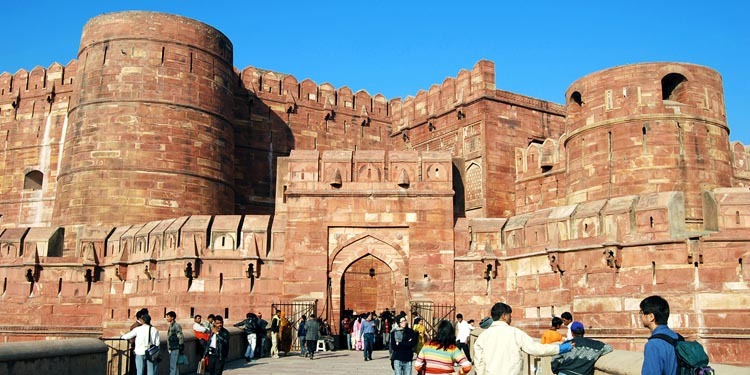 This citadel built in red sandstone offers insight into the Mughals great love for art and architecture. Dinner shall be served onboard as you continue your journey to Ranthambore. Breakfast at an exclusive venue. On arrival into Sawai Madhopur, early in the morning, get ready for an exciting safari to the 'Ranthambore National Park'. Originally the private hunting ground of the Maharajas of Jaipur, Ranthambore was declared a National Park in 1973. The Park is famous for its open sightings of tigers, sambar, chital, nilgai, chinkara, wild boar, sloth bear, hyena, jackal and leopard. The safari cannot be compared to that of Africa and you are indeed fortunate if you spot the elusive tiger or the shy leopard. Proceed for an early morning exciting game drive. The safari is carried out in open vehicles and the ride is quite bumpy. One must carry adequate warm clothes for winter months. Return to the train for a relaxed breakfast. Unwind over lunch as your journey continues to Jaipur. Jaipur, the capital and the largest city of Rajasthan was built by Maharaja Sawai Jai Singh II, the ruler of Amber in the 18th century. It is renowned for its magnificent palaces, forts and temples, jewellery and blue pottery. Proceed for an exclusive royal experience. Your arrival at the venue will be accompanied by the band and the beating of 'Nagadas' (huge Indian drums). You shall also have an opportunity to indulge with the elephants – paint them, feed them or opt for a joy ride. Later, enjoy Cocktail dinner over sparkling wine at the venue. 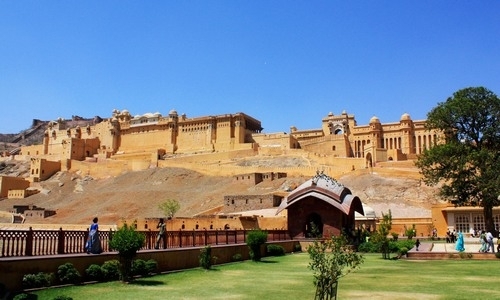 After a leisurely breakfast onboard, proceed to visit the Amber Fort. The Amber Fort, set in picturesque and rugged hills is a fascinating blend of Hindu and Mughal architecture. Constructed by Raja Man Singh I in 1592 and completed by Mirja Raja Jai Singh, the fort was made in red sand stone and white marble. The rugged forbidding exterior belies an inner paradise with a beautiful fusion of art and architecture. 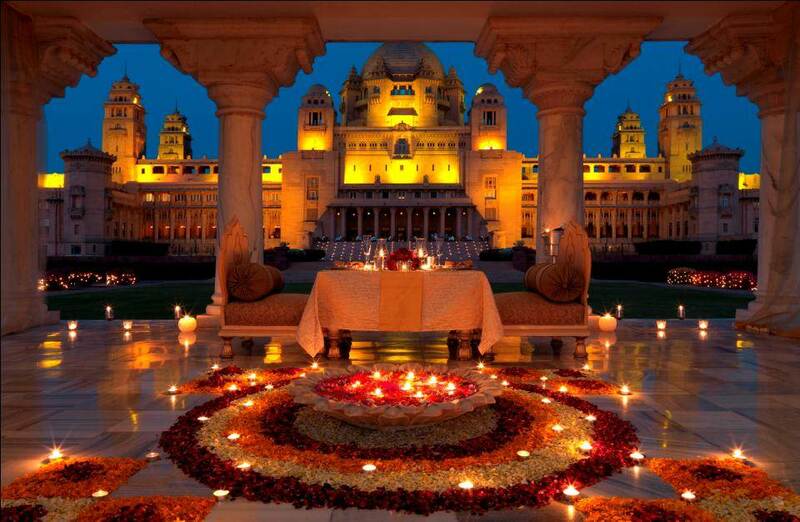 Amber is the classic and romantic fort-palace with a magnificent aura. A short jeep ride takes you up to the fort where you will enjoy a tour of the royal apartments, with striking views of the gorge. Step back into the Mughal era as you enter the Chamber of Mirrors (Sheesh Mahal), and the Hall of Victory. Return back to the train for a leisurely lunch on board. You may choose to participate in one of the optional tours. Enjoy spa facilities at a five star hotel or proceed on a private shopping tour or visit the City Palace and Jantar Mantar. After onboard breakfast proceed to visit the magnificent Mehrangarh Fort. Admire the intricate latticed windows, elaborately carved panels and elegantly curved porches followed by a walking tour of the Old Clock Tower Market. As you reach the Market on Tuk Tuks, get a glimpse of the daily lifestyle of the local residents, passing some of the oldest houses and havelis. Return to the train for a relaxed lunch as the train proceeds it journey to Osiyan, the gateway to the Thar Desert. Osiyan is known for its medieval temples and vast expanses of sand dunes. Later experience the royal pageantry as a convoy of decorated canopied camel carts accompanied by musicians takes you for a Sundowner on the Sand Dunes. Enjoy cocktails, savour traditional mouth watering barbecue delicacies as you enjoy traditional folk arts like the Langaas and Kalbeliyas whose music and dance will mesmerize you. Later return to the comfort of your train by 2130 hours and embark on your onward journey to Udaipur. Breakfast and Lunch on board; evening barbeque on dunes. This morning you will wake up in the picturesque region of Mewar, one of the most popular and royal states of the Rajputana. Admire the magnificent landscape of the Aravali Hills arriving into Udaipur - the City of Lakes. Disembark the train at 1000 hours as you begin your visit with a boat ride on Lake Pichola. Following the boat ride visit the City Palace, the largest palace complex in Rajasthan, with its scalloped arches, fretted balconies, and cupolas. Visit Mor Chowk and see its lavish mosaics of peacocks; Moti Mahal with beautiful mirror work; Chini Mahal covered in ornamental tiles and the spectacular Zenana Mahal where-after visit The Crystal Gallery and the Darbar Hall with an audio guide. Feel like a king as you experience the hospitality at the Satkar Hall of Fateh Prakash Palace reminiscent of the ancient Mewar glory. Feast your taste buds over a vast spread of Indian cuisine. Maharajas' Express proceeds for Delhi at 1900 hrs. Early this morning, after breakfast, you will disembark at around 0830 hours at Delhi Safdurjung Railway Station (DSJ). 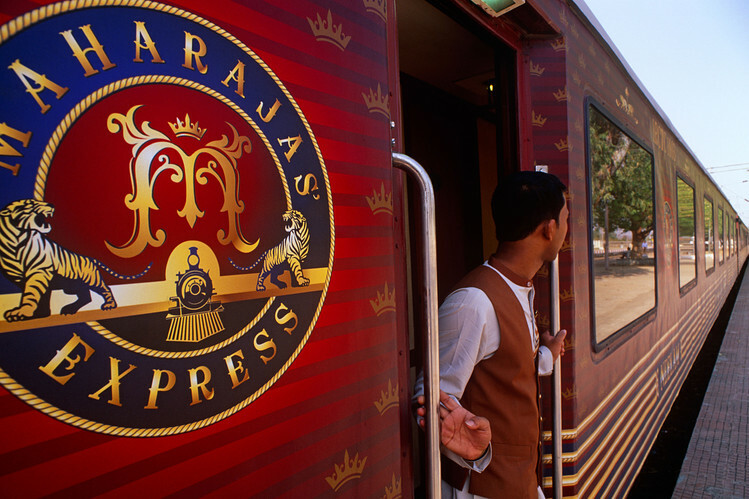 Bid farewell to the Maharajas' Express as your 'The Indian Splendour' journey comes to an end. The royal journey is over, but the memory of which, will live on forever! Breakfast on the Maharajas' Express.